Interactions between the rings on the amino acid phenylalanine (on the tablet) alter the nickel (Ni) active site, while the COOH groups provide proton relays in blue. The relays create a proton path from the active site to the outside of the molecule. 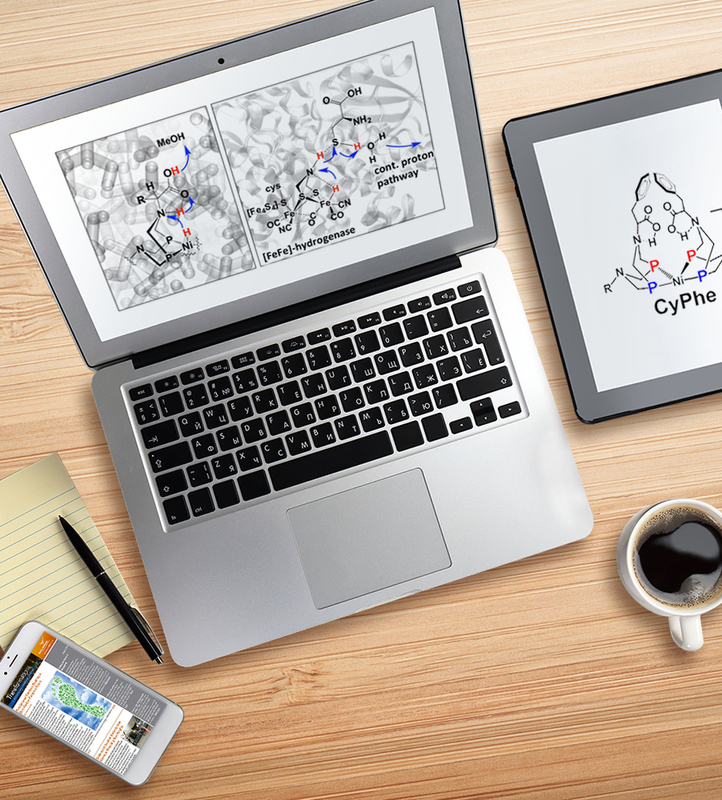 On the computer screen, see PNNL’s molecule (left) and the enzyme [FeFe]-hydrogenase. Both have proton paths with similar features, vital for reversibly producing and breaking hydrogen. Enlarge Image. When it comes to solar power, storing electricity as fuel would let that energy work on dark or stormy days. The challenge is creating a catalyst that can push the reactions to produce a fuel, such as hydrogen, and later break the fuel to release the energy. Mother Nature does this every day in tiny microorganisms, such as those that make up pond scum. These enzymes work in both directions, reversibly, at room temperature and pressure without added energy. Scientists at Pacific Northwest National Laboratory built a catalyst that mimics nature's hydrogen-splitting enzymes—working reversibly at room temperature and pressure without added energy. This was achieved by stabilizing the catalyst's structure by attaching an amino acid that created outer scaffolding interactions and by controlling protons' movement. Introducing this enzyme-inspired scaffold resulted in the highest possible efficiency, mimicking the features of enzymes. Why It Matters: Finding a way to turn electricity into fuels would aid in large-scale solar and wind power as well as fuel cells. Creating and using such fuels requires a fast, efficient catalyst. The team's design solves a key problem within the catalyst: how to operate with minimal energy added, letting it operate in both directions. Energy input is intimately connected with how to move protons. The catalytic cycle will be slow if the protons can't move efficiently because the catalyst's scaffolding is in the way. In this research, the team has laid a path for the protons to travel. Now, the catalyst's scaffold aids in moving protons, instead of blocking them. "This synthetic catalyst is a clear indication of the intricate interplay between the different layers of a catalyst and begins to mimic the complexity observed in certain enzymes," said Dr. Wendy Shaw, who led the research. Shaw has worked on catalysts and their structures throughout her career. Methods: In an enzyme or a synthetic catalyst, swift movement of the protons from the metal where the reaction takes place to the outside of the molecule is essential for the reversible reaction between molecular hydrogen fuel and electricity. The reaction involves combining two protons and two electrons to produce hydrogen, or splitting the hydrogen apart to release the electricity (electrons). The equation is H2 <--> 2H+ (protons) +2e- (electrons). The researchers redesigned the periphery of a nickel-based catalyst, creating a proton pathway. After the H2 is split, the protons easily transit from the metal heart of the catalyst, through the structural scaffolding, to the surrounding solvent, allowing the catalyst to get ready for another cycle of the reaction. To build the pathway, the team added a layer of natural amino acids on the periphery of the catalyst, known as the outer coordination sphere. They used the amino acid phenylalanine. The amino acid added stronger intermolecular interactions in the outer coordination sphere compared to previous attempts to stabilize the active site. This design enabled the catalyst to achieve one of the most amazing features of an enzyme: catalytic reversibility. Reversibility occurred because of interactions between the phenyl rings in the phenylalanine stabilized the desired conformation and the proton pathway. The redesigned scaffold helps position the relays that move the protons along the proton pathway and alter the active site to achieve maximum efficiency. The pathway moves the proton from the nickel at the active site through an amine, NH, and then a carboxyl group, COOH, then to the solvent environment. This simple but controlled movement of protons is crucial for reversibility. The catalyst splits the hydrogen-hydrogen bond in H2 to produce protons at room temperature. It also recombines protons to produce H2. That is, it operates reversibly, without any extra energy needed. This required both the interactions between the phenyl groups and the proton pathway. Before this study, this combination of efficiency and rates was only seen in enzymes at room temperature. The new synthetic catalyst is both fast and efficient. What's Next? This is just the beginning. While this complex is reasonably fast in both directions and operates with the efficiency of enzymes, it is not as fast as the fastest enzymes. 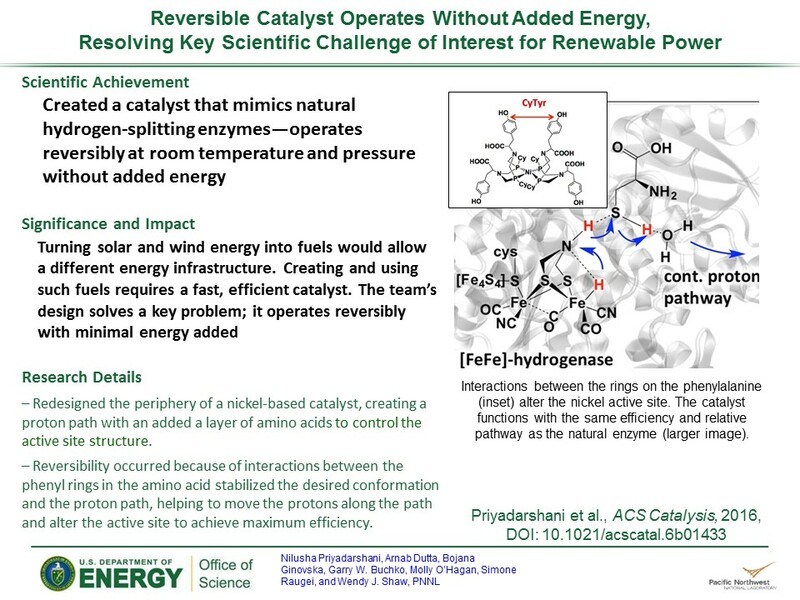 A faster catalyst that is also reversible should be achievable. "This is a key challenge for the future—learning which features are needed and how to get them to work together," said Shaw. Sponsors: Office of Science Early Career Research Program through the U.S. Department of Energy, Office of Science, Basic Energy Sciences (BES), and the Center for Molecular Electrocatalysis, an Energy Frontier Research Center funded by BES. In one sentence: Scientists at Pacific Northwest National Laboratory found that a complex with a proton pathway and stabilized by outer coordination sphere interactions is reversible for hydrogen production/oxidation at room temperature and pressure.